Who says smart girls aren't cool? Sarah Strohmeyer's latest explores the world of overachievers who break away from the stereotypes , adding fun and excitement in their high school experience. 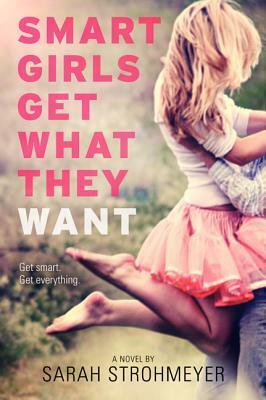 Smart Girls Get What They Want is a cute, witty, humorous, and empowering book for the brainy... and the average. "I am the product of two brilliant inert elements with negative bonding capabilities, one who was a Dr. Who fan girl, the other who consistently drove into fire hydrants..." and thus a hero of nerds is born. What I love about this book is how even though the characters are teenagers, as well as the language used is that of teens (no duh), it’s still very much contemporary and to the point. Stereotypically, smart girls aren’t often asked out on dates or even considered datable by hot guys. In fact, many have dumb down themselves for guys to be interested in them. Gigi, Bea, and Neerja are only the latest brainy girls in high school to fall victim to such standards until they started doing other “cool” stuff besides being a full time nerd (studying consistently). They certainly got a wake up call when Neerja’s super smart older sister wasn’t quite the person they’d held her up to be. I believe the issue emphasized on was success versus happiness, which would you prefer? Genevieve or Gigi is the lead brain, no offense to her just as equally smart counterparts. I’m simply stating that she’s the main girl. Anyways, Gigi’s character is one of great morality. She’s next to perfection, a goody goody; never skipped school, excelled as a honors student, puts her friends first, and never cheated on a test. Well, that’s all about to change. That good girl image is about to change when Gigi is accused of cheating with fellow classmate, Mike. Mike is the jock. The guy in high school that’s hot, rich, and athletic, but hardly on par in his academics. At least that’s what people, even Gigi, perceive. And isn’t that another stereotype, that hot high school guys are stupid and rely on smart girls to help them pass their classes. Gigi starts seeing Mike in a new light once his smartness comes to light. Both are plunged into the drama of cheating and are forced to work together on a project that would somehow relinquish this accusation. If they can collaborate in an equal manner, whereas neither will judge the other based on their high school persona, they just might pull this off. Aside from the cheating issue, Gigi is taken aback by the hot transfer student, Will, who’s described as the smartest of their high school’s male population. While she’s lusting for this dude, I can’t help but consider her and Mike getting together. While that was rather evident, their romance took very long to build up. I’m talking nearing the end of the book. Anyways, Gigi along with her BFFs, Bea & Neerja go on this new journey to change what their fellow school mates thinks of them, by challenging themselves to activities outside of their comfort zone. I’ve forbidden myself from spilling the details here so just read and you’ll enjoy the findings as much as I did. I must say that I was totally pissed at how much of a jerk Justin turned out to be. However, I loved the joke regarding him at the end of the book. I’ll conclude here by saying that seriously, I enjoyed this book. There were some terminology used that made me jump back into my days in high school and I liked that about the story as well. There’s entertainment, drama, teen romance, fighting spirit, and accomplishments. Throw in some schooling and Sarah Strohmeyer has cooked up one of the best contemporary reads for the summer.